But I also changed my finishing method a bit, remember those heavy wash coats. 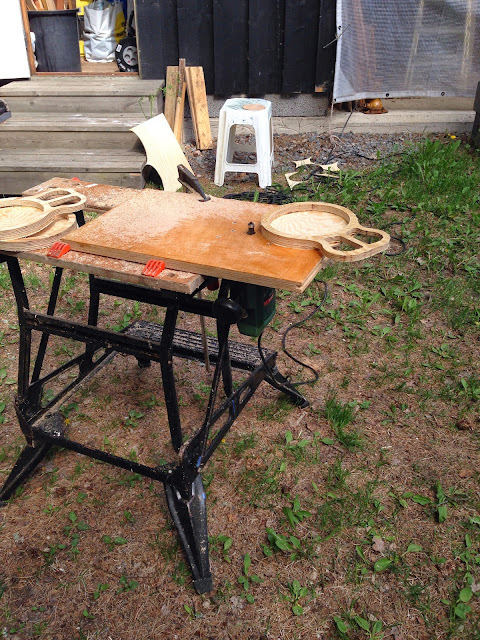 Last time I got out to the big workshop someone had left with the router table. So today I brought my jerry rigged table with the smaller router. It works really well, just have to make sure it's securely clamped. And then this! 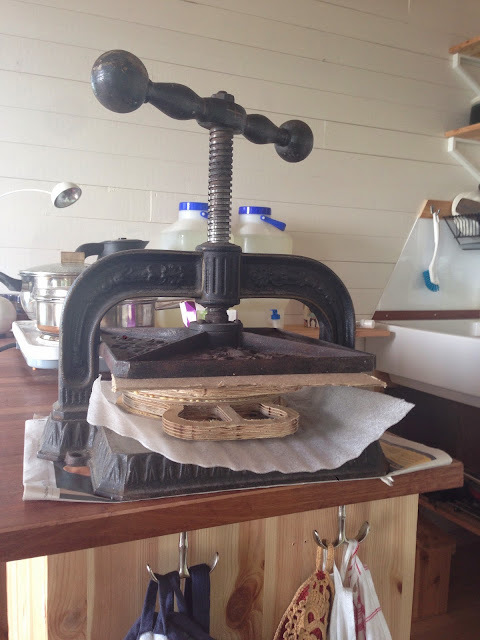 A fantastic old book press that I got from my friend, it's now essential in the making of reso skeletons. Clamping large flat pieces together is rather tricky without a press and this one is perfectly flat and very powerful. I make the skeletons by layering plywood pieces of different thickness. Between the glueing steps I route out the well and the contours using the top most piece as a guide for the flush cut router bit. Then I cut out the bottom of the well so what remains is just a ledge for the cone. And now, duct tape in luthery! 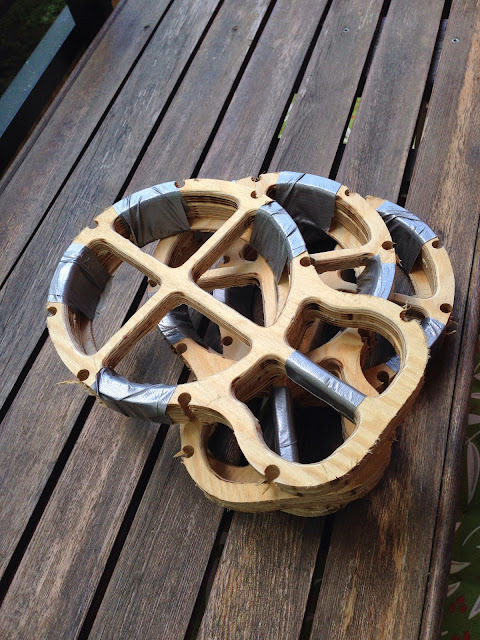 I taped two halves tightly together and drilled the holes around the edges. 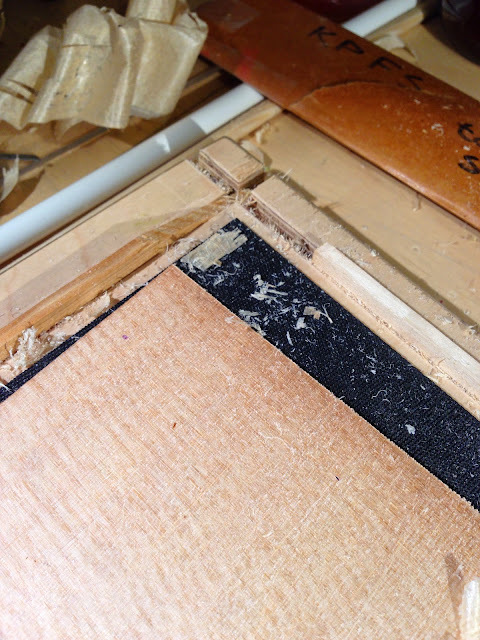 These holes are for 8 mm dowels, and I placed them so the dowels will protrude outside the plywood. I'll sand that off to get a flat spot for the sides to rest on. An electrician was supposed to come and fix stuff today but couldn't make it. So I got some time for myself in the cave. 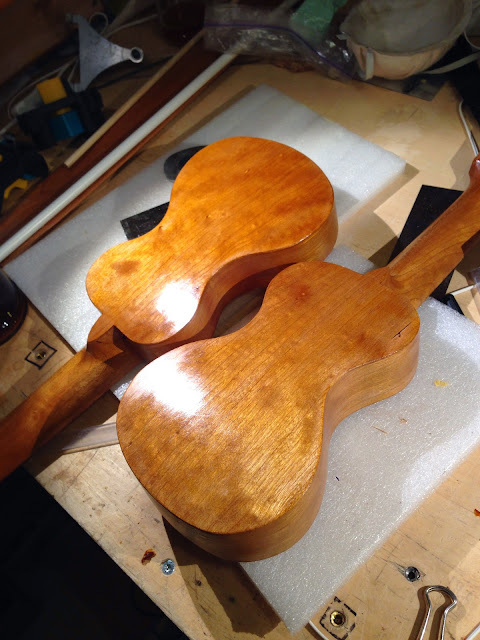 The zs piccolos got a few coats of shellac. They are starting to look really good. And would you believe it, I actually routed off the excess from the top and back with a flush cut bit! 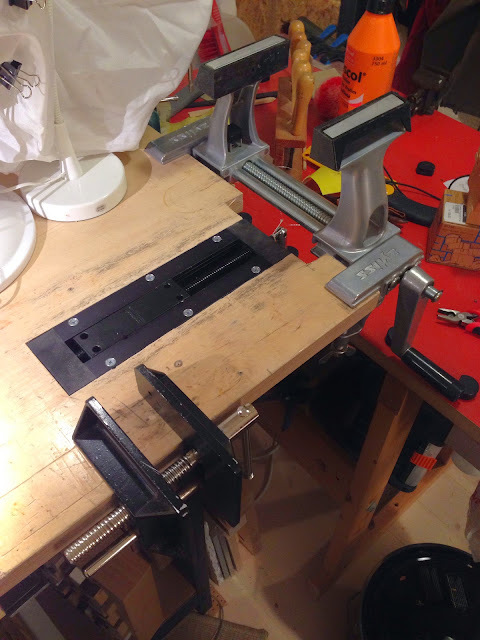 My small router that I found in the trash years ago works really good, it's mounted in a board that I clamp to the bench. I'll show pics next time it's up. What else... well there's the planing board I threw together from thick birch plywood and a sample of a rubber roofing sheet. The friction alone will hold small parts but I also cut dados with my plow plane so I can put wooden strips as planing stops. Doesn't matter if the plane hits one of those of course. 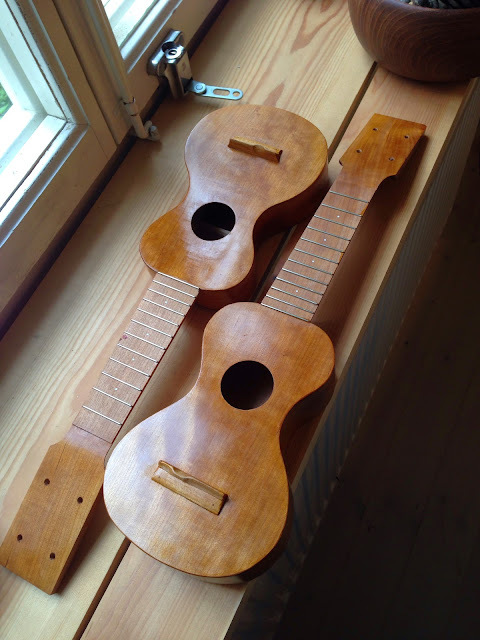 I started on a rather lovely spruce top. 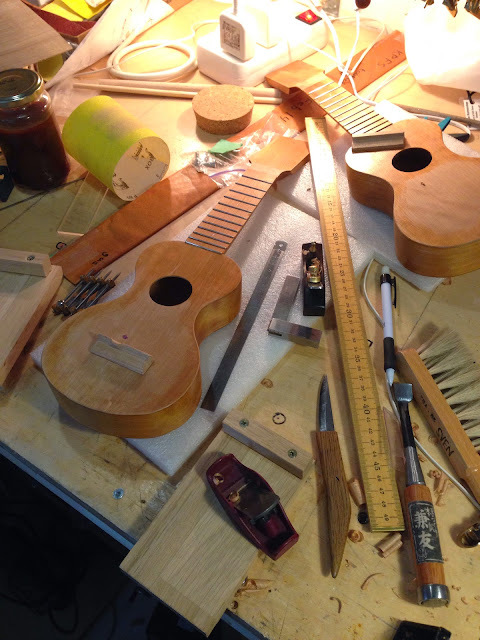 I think I want a spruce top soprano. With rosewood back and sides. 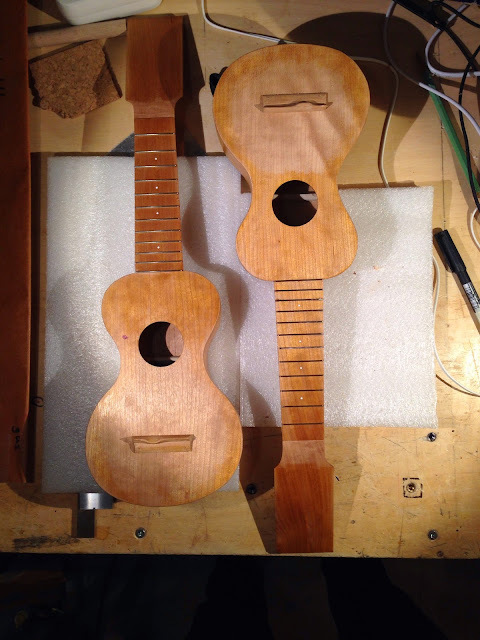 Anyway here are the dados and stops in a close-up. One of the stops is an old guitar brace that I swapped. After a week in the Middle East I took the zs piccolos down from their hooks. The morning I left I put another, rather heavy, coat of shellac on and now it was completely dry. 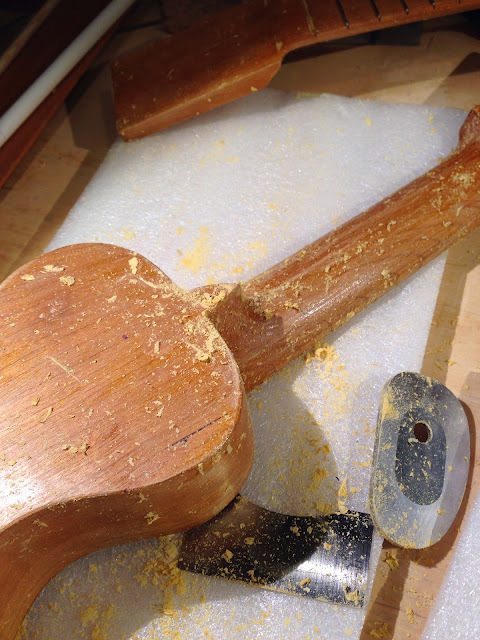 Or at least dry enough to continue, some say shellac takes years to fully harden. Scraping the surface smooth (remember, no sandpaper) I got it level and dull. I seldom remove this much but this was applied thicker than usual. I figure the last coats will go on with the muneca and they are of course smoother right away. And then it was time to go to work, right? Well think again and start thinking like me. 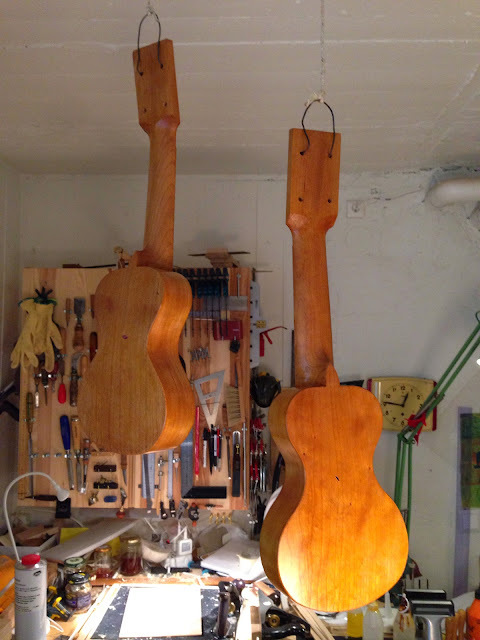 I couldn't stop me from a quick coat on the backs and necks, just to get it underway. Shellac is pure fun. Takes a lot of practice though. In the humble abode of the Argapanator, stuff is after all happening. The piccolos have bridges. It was quite hard to shape them without sandpaper, and me whittling led to a bit more elaborate shape elements. Don't know if any of those are keepers yet - I'm quite happy with the more simplistic bridges I've used thus far. But they look rather good so I won't pop them off and start over. Maybe I'll slather on some more shellac tomorrow, before I go to Tel Aviv again to work. And now a word about my vises. In the pic you can see my Zyliss vise to the right, and my inline vise to the left. 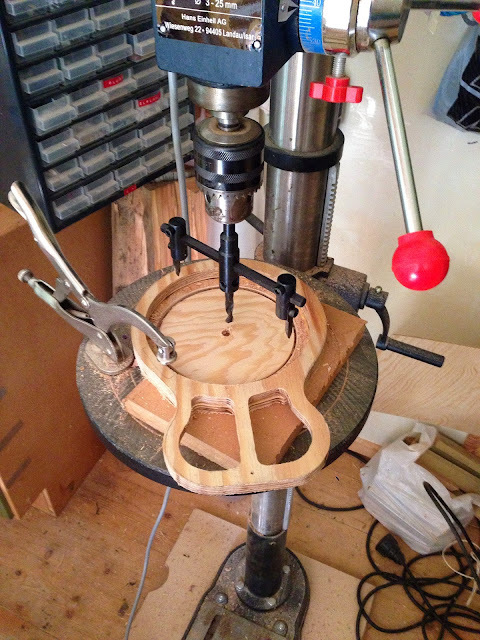 Between them is my latest addition, an inset vise from LeeValley / Veritas. A very fun job it was, to route the recess for it! 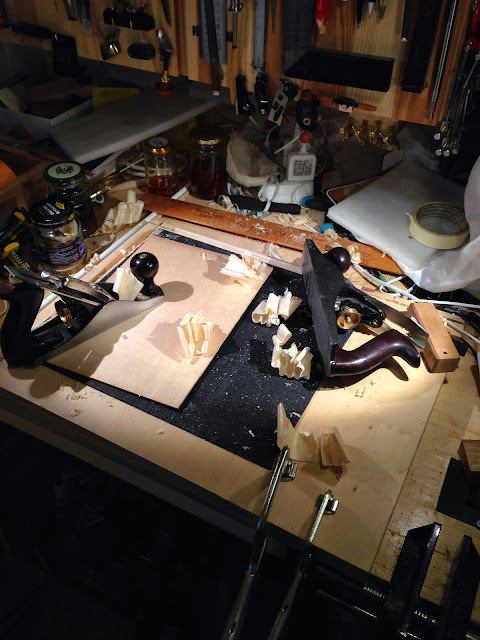 Done with my new Record 71 1/2 router plane, no electricity was killed in the process. I made the cut-out for the handle so the Zyliss can be used on the short side of the bench - I use it like that for example when sharpening handsaws. I know I'm moving backwards in time but why not. The inset vise I'll use for planing. A few dog holes at the other ends and I'm ready to go. The inline vise also comes from LeeValley but it was quite cheap despite that. I bought it on a whim but it has proven to be really useful and versatile. And would you believe it, I saw the exact same vise in a book about guitar building. Now for the serious stuff. 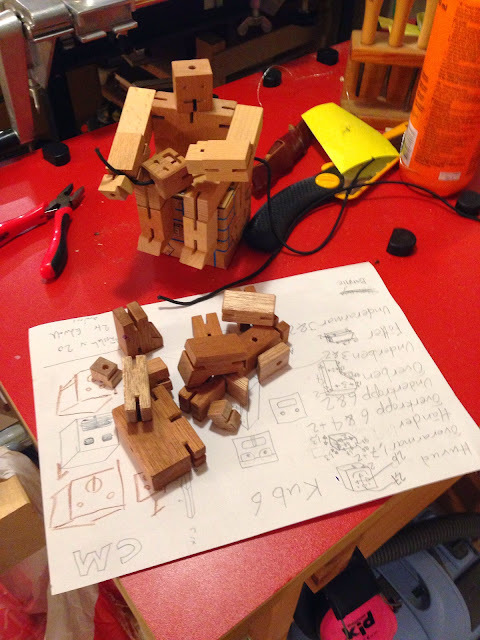 We bought the kids a wooden robot. They played with it for 15 minutes then said, "can we make our own, the same but much better?" Of course we could, and we did. 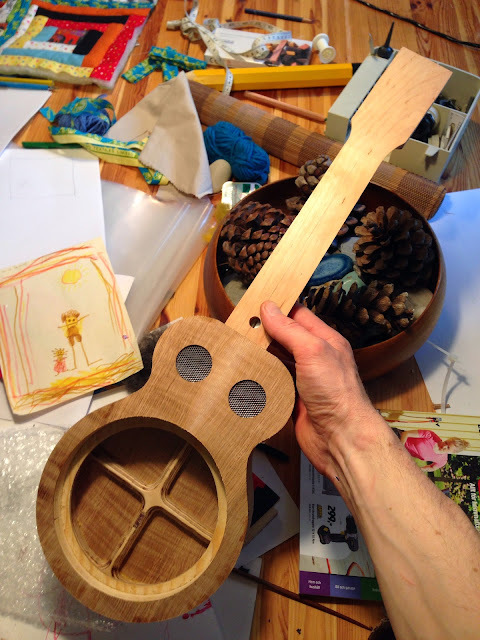 Using only hand tools to plane, cut out and square all parts we had a grand time. The slots were cut on the small table saw though. So now all parts are ready. I expect robot number I to be done with number II when we wake up tomorrow. 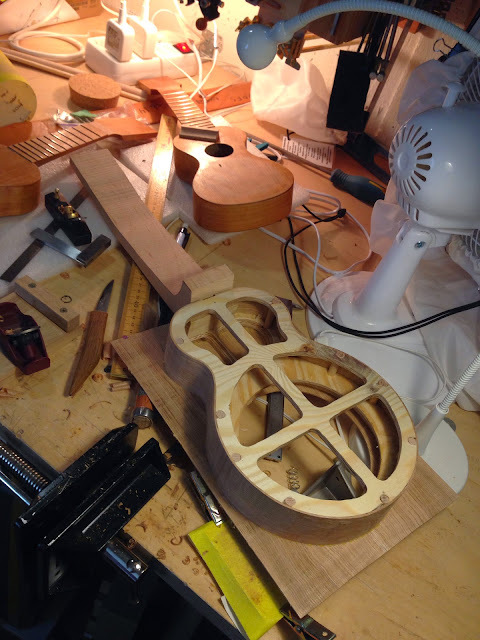 It seems that the first step where I really missed sandpaper was the final shaping of the bridge. With the small areas, the complex geometry and the grain it's really hard to get it good with just edge tools. But I will sharpen a smaller scraper tonight and get it done. But what of the planes? I hear you ask. Well yesterday evening I cleaned out the drawer under the bench and tossed a fair bit of crap that had been hiding there for too long. Now my bench planes have a good home! 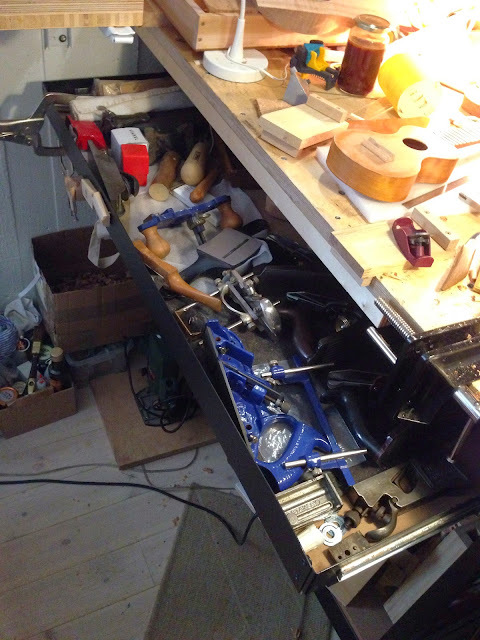 Smaller planes, and my giant jointer, are still in and on the tool shrine, I mean tool cabinet. And the ash reso I'm making for my mate Andy has its top glued on, and a neck of Swedish alder picked out.